Hi all, as one of the enlightenment maintainers on openSUSE i thought i’d give you all a quick review / tour / how to for enlightenment on openSUSE. The version of Enlightenment shipping with openSUSE 13.1 is 17.3 with version 1.7.8 of the enlightenment foundation libraries, this was the most stable release at the time of the feature freeze. If you would like to help us test later versions i wrote about the current plans for our testing repo’s on obs here the other day. While there hasn’t been a major update to enlightenment since openSUSE 12.3 was released Enlightenment on openSUSE 13.1 has a couple of very noticeable changes since 12.3. 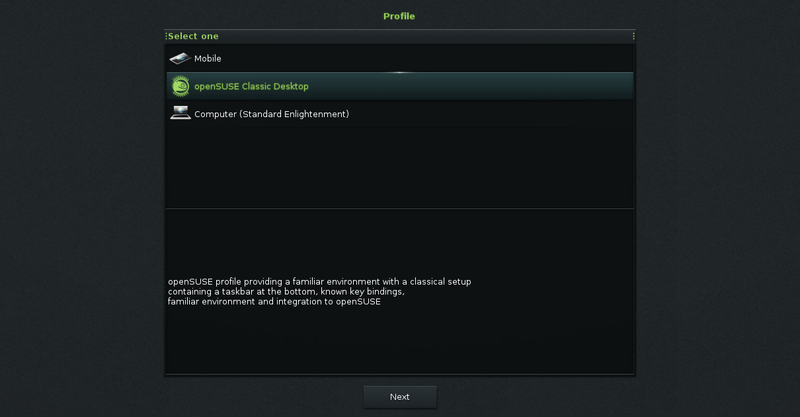 The first is the openSUSE first run profile now works properly rather then causing enlightenment to crash this allows us to provide a setup that will be easier to pickup for new users then the setup included upstream.The style we have gone for think start button in the bottom left with a task bar. 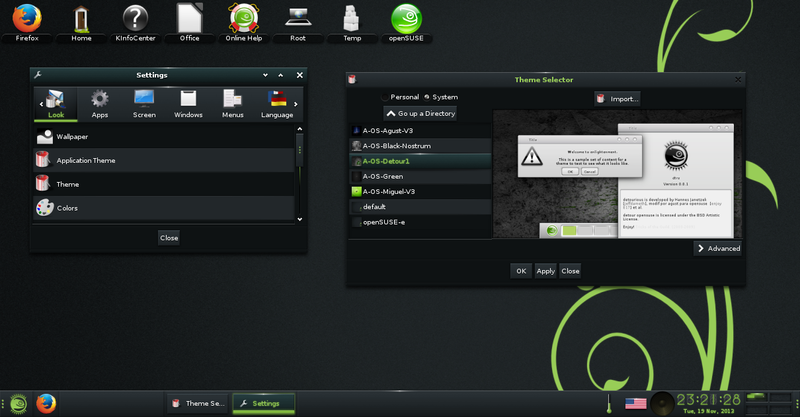 It has also allowed us to implement the second major change, a theme with a wallpaper and color scheme that is the same as the one used throughout the rest of openSUSE 13.1 i talked about it in more detail here (If you don’t like it you can use one of the many other themes we ship). 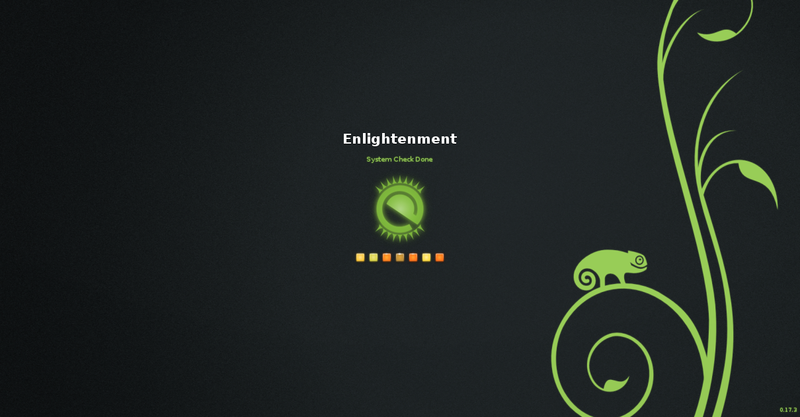 OpenSUSE 12.3 was the first version of openSUSE to officially support Enlightenment and it basically shipped Enlightenment as it is with no real customization. In openSUSE 13.1 we have started to reach my second goal which was to provide a version of enlightenment that is fully intergrated with openSUSE, we still have some work in terms of getting it on the dvd + installer and there are a few things that i would like to fix in the profile such as applications in the ibar and loading or not loading a couple of other modules other then that I am happy with the current level of integration. The third goal i have is to rival other Enlightenment specific distro’s that have been supporting enlightenment for longer such as bodhi, this will involve adding more custom themes, extra modules and applications written with the enlightenment foundation libraries. Currently we ship 6 custom themes and 4 extra modules. While we can’t provide the same number of extra’s as some distro’s and the same level of integration with network settings etc, we can provide the large amount of other software available for openSUSE, the excellent configuration tools as well as the tumbleweed rolling release system and for these reason’s i would recommend existing e17 users trying e17 on openSUSE. I would also recommend openSUSE users give it a shot, i have found Enlightenment to be the most configurable window manager that is also light weight(I’m writing this using Enlightenment on a 8 YO laptop) and looks good. It is the sort of thing that you probably won’t find your ideal configuration until you have spent a couple of weeks trialing different configurations and combinations of settings. Bohdi has a excellent overview and user guide here that is mostly applicable to openSUSE as well. Finally i would like to thank everyone else who is helping contribute to Enlightenment on openSUSE including the large number of people that have tried it on a release candidate and reported bugs. Below i have put a brief how to section and some screen shots there are some more screenshots here where i introduced the theme. Using the main menu as a file manager. To start with as Enlightenment isn’t a complete desktop environment and as mentioned above isn’t available on the openSUSE 13.1 DVD i would recommend installing openSUSE with a alternative desktop environment. I generally install KDE as i use more KDE apps then gnome but there is no issue installing gnome either. I should point out that due to bugs on our side Enlightenment wont work properly from a “Minimal X Server Install” this is due to a missing dependency that i am yet to find. After openSUSE is installed run Yast and go to the software management section and search for “patterns-openSUSE-e17” and install this. Then log out of the system you are in and select Enlightenment at the login screen. Follow through the first run wizard, I would recommend choosing the openSUSE classic profile and leaving the taskbar enabled. After that you are done start playing with settings and “have alot of fun” remember that if you get stuck with your configuration you can always go back and run the first run wizard by going to the settings tab in the settings dialog, then selecting profiles and pressing the scratch button. You guys have done an excellent job with E. The theme looks great, and E is running very well. I’ve been using it since 13.1 beta3, using the Factory builds. 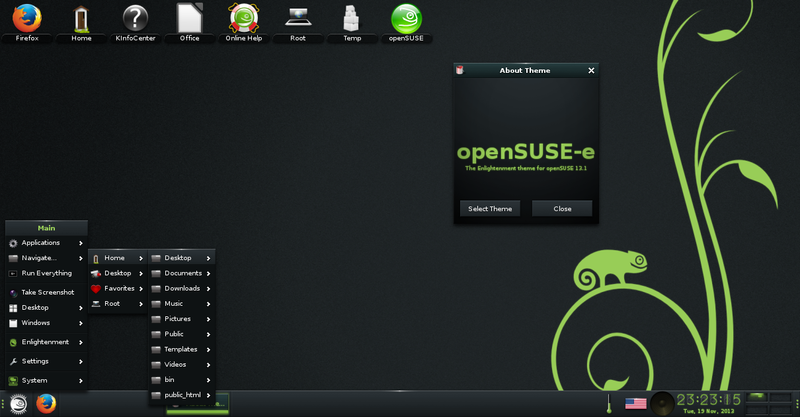 Thanks so very much for bringing E to openSUSE! No probs, I’m glad you are enjoying it. Probably seems like a stupid question, but can I install Enlightment desktop alongside my KDE desktop, just choosing the whichever desktop at logon? I would like to use Enlightment for my multimedia work… I use audio visual production apps a lot. I have the idea that KDE is not so lightweight, however I would like to keep it. This is maybe a real noob question, but would like a honest answer. That is exactly how i use enlightenment, i install kde from dvd then add enlightenment over the top and choose enlightenment at login. In my experience on my older laptop e17 definitely performs better then kde. If you go to settings -> look -> composite -> Rendering and ensure that you don’t composite fullscreen windows then run your multimedia apps fullscreen enlightenment wont be used for rendering while they are running. Someone was working on Petite Linux, but i don’t think that has been touched since openSUSE 12.2, you should be able to install e17 from a net install as all the repositories will be loaded. Good call. Enlightenment on the main DVD would be great. I was under the impression that it would take removing LXDE in order to do so, which I’m all for. I will attempt the net install, but do I also need to install another desktop environment? I would like just E17 as my desktop ala Bodhi. I thought eventually we would have LXDE and enlightenment but unfortunately that didn’t happen for 13.1. Theoretically it is possible to install e17 without another environment, when i tried a complete minimal install i had some dependency issues that don’t show up if kde or gnome is installed, hopefully, the apps you install will be enough to pull in the dependencies otherwise you may need to install kde or gnome as well. I will fix it for 13.2 i ran out of time for 13.1.
many thanks – looking good and feeling very responsive, outranks lxde IMHO! Trackback from : Distro advice, how much RAM do I really have?